After all the complaining, hand-wringing and even outright demeaning of self-publishing over recent years, the proof is now irrefutable. Ebook buyers are buying more Indie published books than any other. The latest report from Author Earnings paints a very rosy picture for Indies while the Big Five have taken a huge fall in market share. 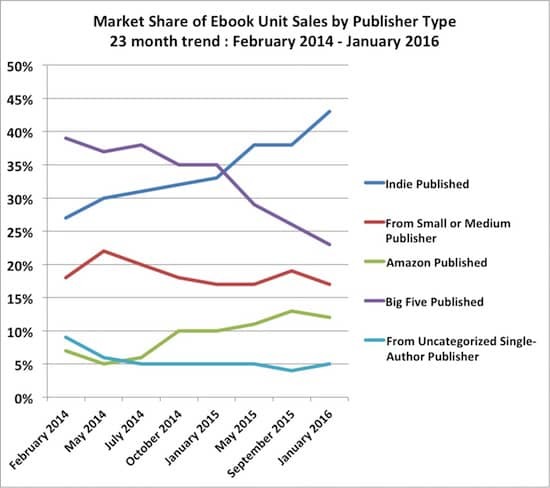 In two short years, the market share of paid unit sales between indie and Big 5 ebooks has more than inverted. 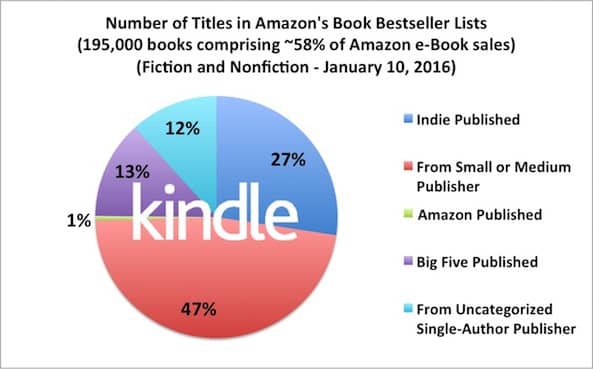 The Big 5 now account for less than a quarter of ebook purchases on Amazon, while indies are closing in on 45%. In two short years, the market share of Indie-published ebooks has almost doubled, and the trend line is continuing to rise sharply. 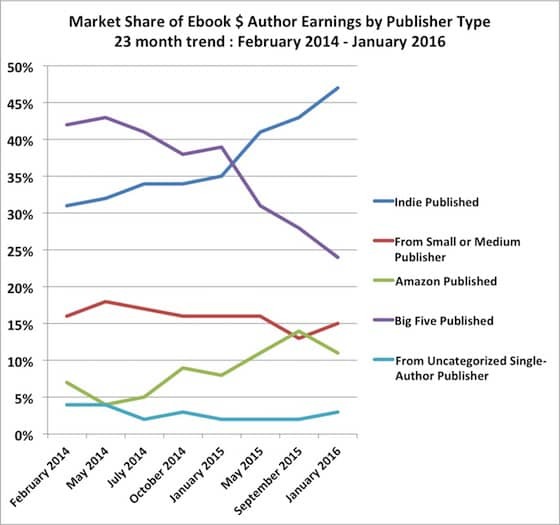 The trend line is similar for author earnings, with Indie authors accounting for over 45% of overall earnings. While it would be logical to think that only a small upper percentile of authors and titles account for the bulk of the earnings, this graph from the report paints a very different picture. 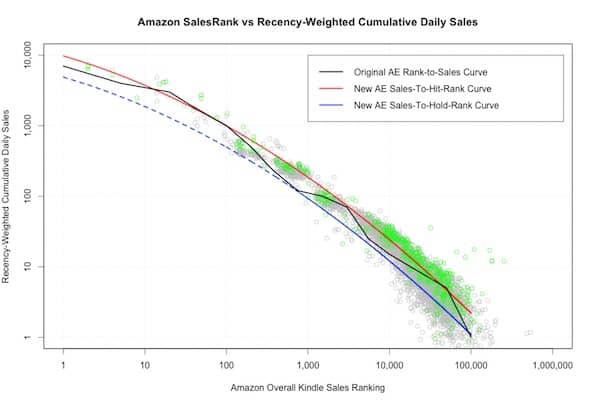 In fact, the bulk of ebook sales are for books that have an Amazon sales ranking of between 80,000 and 100,000. Of course, very high ranking or bestseller titles will earn more individually, but it is clear that the ebook buying market is very price sensitive, and are looking for value for money reading. So much so that this value proposition more than likely explains the number of Indie titles in the bestseller lists. This snapshot is from January 10th. Of course, self-publishing is a tough business, and every Indie author knows how hard it is to build consistent ebook sales, but from the data in this report, there is no doubt that there is a huge Indie book buying market to be had. Like any other business, though, only the best will succeed. This report proves that the book buying market has changed radically and is very different from only two short years ago. Indie publishing is now overwhelmingly accepted by the reading market, and if as an author, your product and promotion are good enough, there are ebook buyers ready and very willing to buy great Indie ebooks. It is a very rosy picture indeed for Indie authors. ebooks may have taken market share, but market share of what? Many (a majority perhaps?) of ebooks are free or priced at $.99. How does giving away or deeply discounting content help authors make a decent living? Market share, in itself, has no meaning. What would have meaning would be a chart showing a distribution of gross dollars and another showing royalties paid to author across the same spectrum..
Time is money and to download and read a free ebook still requires an investment of time. Just because it’s free or deeply discounted doesn’t mean it’s good. Quantity is not quality and one should not confuse the two.